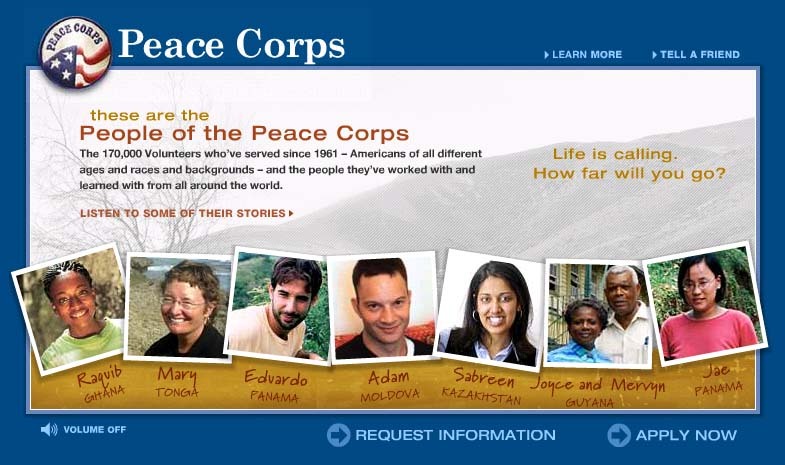 Peace Corps has a great new recruitment tool on its web site. See, hear, explore -- Peace Corps service as told through this moving interactive feature. See, hear, explore -- Peace Corps service as told through this moving interactive feature. Returned Volunteers met with author Philip Weiss in Baltimore on June 18 to discuss the murder of Peace Corps Volunteer Deborah Gardner. Weiss was a member of a panel that included three psychiatrists and a criminal attorney. Meanwhile, the Seattle U.S. Attorney's office announced that Dennis Priven cannot be retried for the murder. "We do not believe this case can be prosecuted by anyone, not only us, but in any other jurisdiction in the United States." Read background on the case here. After Uzbekistan, the Peace Corps has announced the suspension of a second program this month - this time in Haiti. Background: The suspension comes after a US Embassy warning, a request from Tom Lantos' office, and the program suspension last year. For the record: PCOL supports Peace Corps' decision to suspend the two programs and commends the agency for the efficient way PCVs were evacuated safely. Our only concern now is with the placement of evacuated PCVs and the support they receive after interrupted service.